Banned Books Week is over. Much was made about the recent attempts of one Wesley Scroggins to have certain immoral books removed from the curriculum of the Republic, Missouri school district. (I find it a little ironic that this guy lives in a place called Republic, a word which generally conjures up thoughts of democracy and freedom.) He says he’s “spent the last couple of years reviewing the various curricula across numerous grades”, so I’m guessing he must have quite a laundry list of filthy books. Though for an opinion piece in the Springfield News-Leader he singles out three books: Speak by Laurie Halse Anderson; Twenty Boy Summer by Sarah Ockler; and Slaughterhouse-Five by Kurt Vonnegut. Lots of people have blogged about this over the past week. As well they should. People banning books is a serious threat to any society. Books are filled with words that shape a story which in turn helps us make sense of the world, just a little. And we humans are the only animal who really, really need to make sense of our world. We make ourselves nuts sometimes with the trying. Stories help. Books help. It’s so essential to us that long before stories were written down, they were spoken. And those stories were passed orally generation to generation, because people thought it was important to keep the stories alive. I read a lot this past week. And I shuffled over to the ALA website to take a look at the list of banned and challenged books over the years. The list is long, the reasons for wanting the books banned varied. Too filthy, too racist, too subversive, too offensive, too witch-crafty, and even, too naked. As in Mickey-in-the-Night-Kitchen naked. 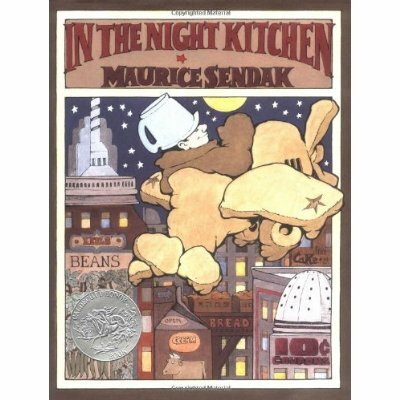 In The Night Kitchen is a picture book by Maurice Sendak in which a young boy named Mickey hears a noise in the kitchen, goes to investigate, and discovers three jolly bakers preparing a cake for the breakfast. Evidently, the problem for some people is the fact that Mickey falls from upstairs and lands in the kitchen. Naked. It’s not as though he’s naked through the entire book. He falls into the cake batter and emerges in a brown suit of batter, and then gets to do fun stuff like craft an airplane out of bread and fly around the kitchen in it. Towards the end he dives into a bottle of milk and the batter dissolves. For a brief period he is naked again, until he finds himself in his pajamas, back in bed, where everything is as it should be. I don’t know about anyone else, but my son and I loved that book. It’s the perfect rendering of a child’s fanciful dream. So keep telling stories, people. Keep writing books, and reading them, and most of all, keep speaking out when someone tries to stop you. And GO, Mickey, you bare-naked dream boy.